It’s hard to imagine a luxury crossover more ubiquitous than the Lexus RX. But for years it’s had one fatal flaw that has pushed buyers elsewhere and driven dealers to tears: it doesn’t have a third row of seats. Today at the LA Auto Show, this oversight was corrected, and you can expect the 2018 Lexus RX L to print money for Toyota. The current generation of Lexus’ bread-and-butter crossover and top-selling vehicle debuted in 2015, but with this update, it finally gets the larger version with a third row that buyers have demanded for years. Unexciting? Probably, yes. Important? Definitely. Lucrative for Lexus? Hell yes. After all, the RX alone makes up something like a third of all monthly Lexus sales. And now it has more room to stuff kids into. My god, look at that. It’s beautiful. 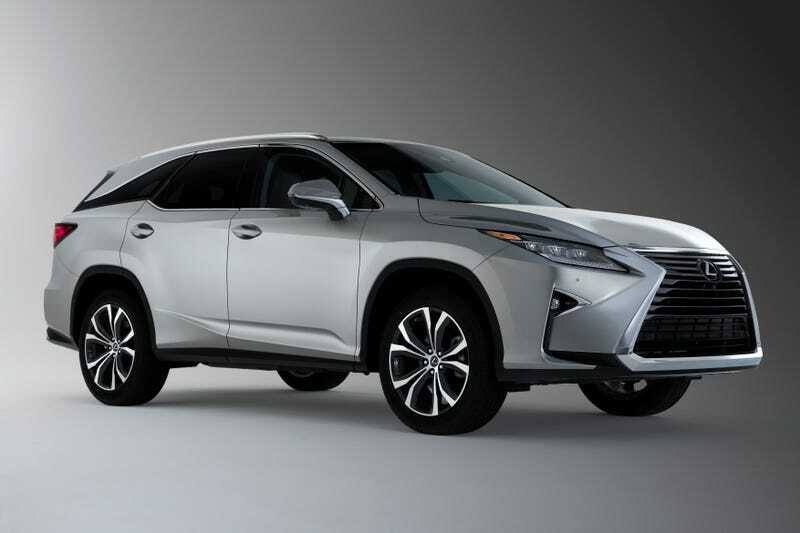 Onto the specs: the base two-row Lexus RX sticks around too, if three-rows isn’t your bag. The bigger one comes in two flavors, 350L and 450hL. The base gets a 3.5-liter V6 with 290 horsepower and 263 lb.-ft of torque. The latter is a hybrid with two electric drive motor-generators producing 308 combined HP. All-wheel drive is optional on the base car and standard on the hybrid. They start at $47,670 for the front-drive RX 350L. None of that even matters. The only thing that matters is three—the number of rows of seats in this thing. It’s going to be a massive hit for families, perhaps the biggest boon to the RX itself since it went on sale in the late 1990s and effectively launched this segment. Yes, it’s effectively a minivan now, but minivans get the job done. And unlike other luxury brands mailing it in these days, Lexus is actually trying with some cool stuff like the LC Coupe and the various F models. If this pays the bills for more of that, so be it. I hope we get to come to your island, Akio. But not for the hunting! Maybe just for cocktails.